National Geographic expedition ship dropped anchor at Nusa Penida, sur 18 Octobre 2014, bringing 85 Durrell Wildlife Conservation Trust environmentalists to witness a return to the wild of Critically-endangered Bali starlings. Registered on IUCN Threatened Species List, the birds are protected by traditional laws on this three islands Bali Bird Sanctuary – a program run by Friends of the National Parks Foundation (FNPF) with the help of local communities. Nusa Penida, Bali – 22 Octobre, 2014: INDONESIAN conservation NGO Friends of the National Parks Foundation (FNPF) joined with Durrell Expeditions bringing 85 UK ecologists and conservationists by National Geographic explorer ship witnessing a wild release of Critically-endangered Bali starlings back to the wild at the protected island bird sanctuary, off Bali. Under protection by traditional law, the Bali starlings are released by FNPF at this local three islands haven – Nusa Penida, Nusa Lembongan and Nusa Ceningan – now known as Bali Bird Sanctuary established by FNPF in 2004 to provide a protected habitat safe from wildlife traffickers who had almost poached the Bali starling (Leucopsar rothschildi) to the brink of extinction from the wild in its native Bali. Members of the UK-based Durrell Wildlife Conservation Trust the conservationists visited FNPF on Nusa Penida for a ceremonial release of four Bali starlings – registered as Critically-endangered on the 2014 IUCN Red List of Threatened Species - during a ‘Critical Species and Islands-at-Risk’ expedition on board MV National Geographic Orion through Borneo, Bali and Komodo. Researching environmental issues and conservation programs working to save endangered species in threatened global ecological hotspots, the Durrell Expedition team commended the Head of Klungkung Regency and local government officials in attendance for the recognition of this important island bird sanctuary now under approval process as protection under legal legislation. “The Bali starling is much loved around the world and we can see the way you are working with the local community to protect the Bali starling will lead to great success – you will save the Bali starling,” Lee Durrell, Honorary Director of Durrell Wildlife Conservation Trust told Head of Klungkung Regency, I Nyoman Suwirta during a ceremonial speech at the FNPF Nusa Penida conservation centre. 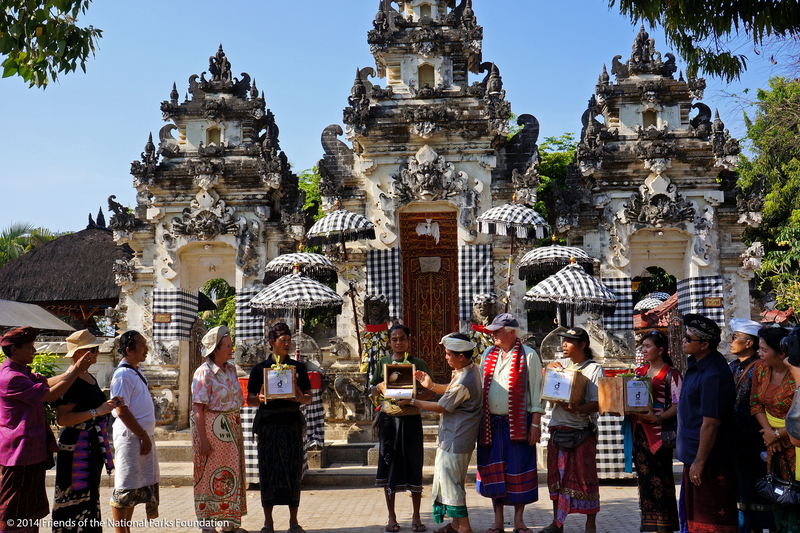 “It’s a good example to the rest of the world that you’ve got to respect the local traditions, and work very closely with local people to succeed – it’s not easy, but usually works,” said Lee Durrell, who had heard of the work of Dr Bayu Wirayudha and FNPF to save the Bali starling – waiting for two years to meet him on this expedition and attend the release ceremony on Nusa Penida. Success of the FNPF Bali Bird Sanctuary conservation program has seen the protected Bali starling population on Nusa Penida increase to over 100 from less than 10 birds left in the wild. “Recognition of Nusa Penida island communities working together with FNPF to save the Bali starling is gaining more world attention,” explained FNPF Founder & Director Dr Bayu Wirayudha. “Importantly, local government is now more aware of working with communities to protect our wildlife habitats and strengthening legal protection which will bring sustainable benefits by attracting ecotourism,” he said. Passengers onboard MV National Geographic Orion – the first cruise ship to ever visit Nusa Penida – declared the traditional Balinese Hindu ceremonial bird release as the highlight of the three week Indonesian islands exploration – l' 4e conservation-focused expedition for The Durrell Wildlife Conservation Trust. “Today was really the highlight – without a doubt,” said MV National Geographic passenger Collin Steven. “One of the main reasons we came on the Durrell Expedition was to release the Bali Starling – and now with this bird sanctuary here it seems conservation is working, which is really good news”. About Bali Wildlife Rescue Centre – Tabanan, Bali: One of only seven wildlife rescue centres in Indonesia, Les Amis de la Fondation des parcs nationaux (FNPF) operates Bali Wildlife Rescue Centre to care for, réhabiliter et libérer les espèces menacées natif – the victims of illegal trading and poaching. The centre is currently home to 50 primates et d'oiseaux en voie de disparition, including gibbons, macaques and eagles – most rescued have been kept as pets or for entertainment. FNPF manages Bali Wildlife Rescue Centre with funding and support from the Humane Society International (L'Australie).